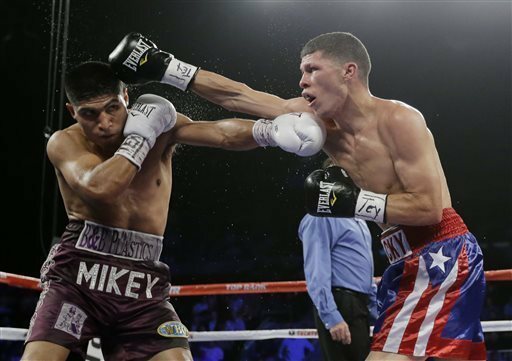 CORPUS CHRISTI, Texas — Mikey Garcia stopped defending champion Rocky Martinez 56 seconds into the eighth round Saturday night to take the WBO junior lightweight title. The 25-year-old Garcia, from Oxnard, Calif., floored Martinez with an uppercut, sending the Puerto Rican fighter to the canvas for the first time in his career. "I thought it was a very good punch when I landed it," Garcia said. "I felt I really hurt him, enough to where he wouldn't get up. I had a feeling it would be over after I connected." Garcia improved to 33-0 with his 28th knockout. Martinez dropped to 27-2-2. After falling down with 15 seconds left in the second round, Garcia weathered through five mostly calm rounds at American Bank Center before launching his attack in the sixth. Garcia finished the seventh round by connecting on a right uppercut and, with many in the crowd of 5,124 cheering him, ended it in the eighth. "I felt his power from the very first punch," said the 30-year-old Martinez, whose last bout was a 12-round split decision in April against previously undefeated Diego Magdaleno. "He's a strong fighter. I knew I was fighting a high quality opponent and I knew when I knocked him down the first time that he wasn't hurt." The two fighters were on the same card Jan. 19 in New York when Garcia won the WBO world featherweight title with an eight-round technical decision over Orlando Salido, and Martinez held on to his junior lightweight belt with a draw against Juan Burgos. Garcia was stripped of his featherweight title in June, when he failed to make weight for a defense against Juan Manuel Lopez. On Friday, Garcia weighed in a quarter-pound under the 130-pound limit. Martinez connected on only 14 percent of his punches, including 10 percent of his jabs. Garcia, who came into the fight in the rare position of both challenger and favorite, connected on nearly half of his 127 power punches, which included the 16th knockout punch in his last 18 fights. In the final three rounds, Garcia landed 52 punches to Martinez's eight. The bout was the main event on a nine-match slate. "We were doing great up until that point," Darchinyan said. "I felt I was winning the fight. He caught me with a few shots and that's just the way it goes." Donaire connected on more than half of his power punches. He had surgery on his right shoulder after his most recent fight, a loss by decision to Guillermo Rigondeaux. "Vic hit me hard and it felt like he broke my jaw earlier in the fight and all I was thinking was, 'I'm going to lose,'" Donaire said. "But I continued fighting and found an opportunity to land a great shot." Demetrius Andrade, from Providence, R.I., won the vacant WBO junior middleweight title, outpointing Armenian-born Vanes Martirosyan in a split decision. Andrade improved to 20-0, and Martirosyan dropped to 33-1-1. "We stuck to our game plan, which was jab, jab, jab," Andrade said. "We weren't prepared for the fast knockdown and we had to play a little catch-up after that." In the first featured fight, Jamaica's Nicholas Walters (23-0, 19 KOs) claimed the WBA featherweight title with a fourth-round technical knockout of Mexico's Alberto Garza (25-6-1).